A district councillor who was suspended from the Conservative Party has defected to the British National Party. 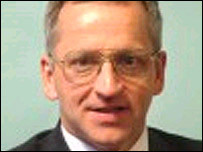 Robert West, of South Holland District Council, in Lincs was suspended after he spoke at a BNP meeting. The 50-year-old said his switch was prompted by Conservative leader David Cameron's priority list of candidates for the next general election. He said the list excluded white male candidates in favour of women, non-whites, homosexuals and lesbians. In a statement, Mr West said: "I have decided to seek refuge from political correctness by applying for asylum with the British National Party - Britain's finest and most decent party - in our country's hour of need." Mr West said he had been a lecturer in political philosophy and equal opportunities law. He has set up his own church, based in a house in Holbeach, to preach "traditional bible beliefs". He said Conservative leader David Cameron was "talking nonsense" when he recently called on people to oppose the BNP. David Graves-Moore, deputy chairman for South Holland and the Deepings Conservative Association, said the local association had earlier decided against suspending Mr West, even though he had been suspended by the party at a national level. "If we had known what we know now when we interviewed him we would have come to a different conclusion and suspended him there and then. "He argued that he went to them (the BNP) to preach the gospel to them. "If Mr West stands for the BNP in the next election I am confident we can defeat him," Mr Graves-Moore said.